A vehicle must not send out visible smoke for more than how many seconds? Correct. A vehicle can only produce smoke for a maximum of 10 seconds. 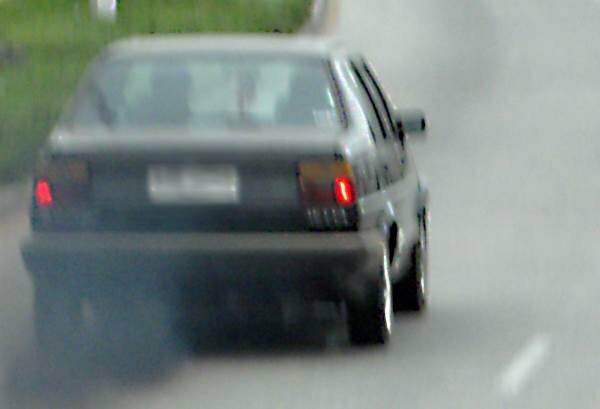 Smoky vehicles cause unnecessary pollution. This also applies to smoke caused by loss of traction, which in itself is an offence. A vehicle should not produce visible smoke for more than 10 seconds. The majority of vehicles run on petrol or diesel, with a few running on natural gas. Exhaust gases are the result of this fuel being burnt in the engine. If an engine is tuned well and not using oil, the amount of smoke from the exhaust will be minimal. When a vehicle is cold you will see vapour coming from the exhaust that disappears once the engine is warm. Once a well-tuned, good-condition engine is warm, there will be very little visible smoke unless a lot of throttle (acceleration) is applied. Black smoke can indicate that one or more of the spark plugs needs replacing, or that there’s the wrong mixture of fuel/air in the engine. In a fuel-injected vehicle problems with a number of parts could cause black smoke: cam sensor, fuel injector, map sensor, ECM computer, fuel pressure regulator, or ignition circuit. It’s usually possible to change the spark plugs easily. If this doesn’t fix it you might need to see a mechanic. If your head gasket is blown or the cylinder head is cracked it will cause white smoke with no real smell. The white smoke is caused by water mixing with the fuel, and can be the result of a leak in the intake manifold (also called inlet manifold), too. You’ll need to see a mechanic. If the smoke is a light grey/white, it could be from transmission fluid. You’ll need a mechanic. Blue smoke is caused by the engine burning oil. This should be investigated because it can eventually result in the engine seizing. It can be caused by a number of things such as not changing the oil for a long time, worn rings, a plugged PCV valve, fault valve stem seals, too much oil, or transmission fluid being sucked into the intake manifold. The worst case scenario is an engine rebuild. Particulates from exhaust gases cause pollution. The government has progressively introduced more and more stringent requirements for vehicle emissions to help improve our environment as the number of vehicles on the road increases. Airborne pollutants are particularly problematic when there are light winds as they don't blow away. Exhaust gases consist of nitrogen, carbon dioxide, water vapour and (if you drive a diesel) oxygen. All these are fairly benign, but it’s the trace elements that are the problem. They are nitrogen oxides (NOx), carbon monoxide (CO), sulphur dioxide (SO2), hydrocarbons and, if it’s a diesel engine, diesel soot and particulate matter.